Michael Gove has been offered the job of Brexit secretary in the wake of Dominic Raab’s resignation, as Theresa May battles to shore up her authority, but he is demanding a shift in the government’s negotiating strategy first, Whitehall sources say. Although he declined the offer, he agreed to support Mays proposals, but that was yesterday. Today he has changed his mind once more, and a very junior minister has taken his place, and now Gove is trying to gang up with the extremists. With friends like that, who needs enemy's? After two or more years of gobbledegook - alternative facts, psychotic events, imperialist nostalgia, wishful thinking, political fiction, and downright lies – we now get to the bit where logic, facts and reality, at last, get an honest hearing. So, how do you make sure that Brexit has finally “shuffled off this mortal coil, is no more, has had its last squawk, fallen off its perch and is f****** dead?” Auntie Theresa has the answer. Rely upon the support, for the final Brexit negotiation, of the silliest politician in parliament, Michael Gove. 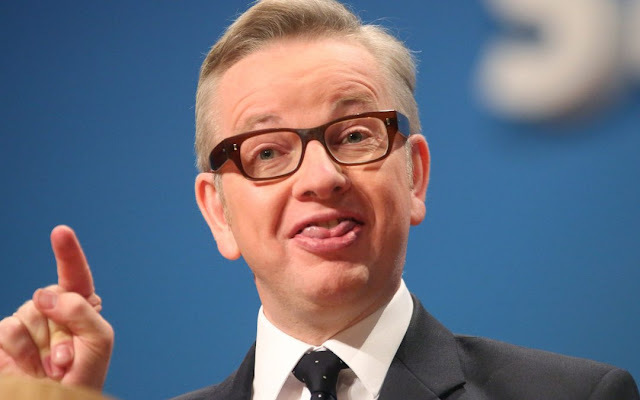 A man renowned for his huge vanity, obsessive self-serving, and nascent perfidy, who else could good old Theresa manipulate and cajole into taking part, other than - Bojo’s old friend and Co-conspirator - the puffed up Michael Gove. Yes, Prime Minister, with a final Coup De Gras, who better to lay some of the blame on for future failure, than UKs most ardent Brexiteer and disingenuous spin doctor? I have said all along that May was playing a clever game, and that by extolling the virtues of Brexit, she was actually damning it. How else do you bury such a profound schism, other than by standing next to the cliff edge, and encouraging everyone to jump? But, even the nostalgic British are not mad enough to jump on a whim, nor a blind person to cross the street without being convinced the road was clear, which it obviously isn’t. In the next few weeks, even the dumbest amongst us will have to try to understand the facts, and retreat from this mindless and bloody dangerous cliff edge. I wouldn’t like to play poker with Theresa May, would you? But, even though you admire her courage and brinkmanship, it may well have cost her job as Prime Minister. Against all odds, she did do a thoroughly statesman like job, and didn’t she do well?